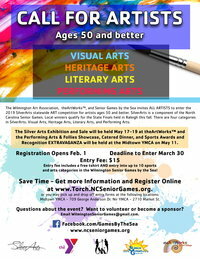 The Wilmington Art Association is a non-profit organization that provides opportunities for area visual artists to gain community recognition through shows and exhibitions. It offers a forum wherein artists, local craftsmen, and people interested in the visual arts can exchange ideas, learn from each other, and contribute to the community. It provides educational programs, demonstrations, and lectures, which will lead to better public understanding and appreciation of visual arts. We regret to announce that the workshop has been cancelled. The Show is open to all artists 18 years of age or older and will include works in painting, pastel, watercolor, drawing, printmaking, photography, digital imaging, fiber art, mixed-media and three-dimensional works. Congratulations to all the wonderful artists who have been recognized with awards this year! Complete list of winning artists for 2019! 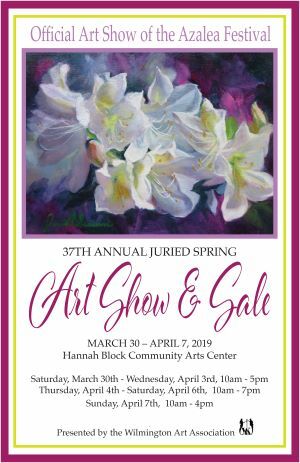 The support of all our donors and sponsors who so generously supported the 37th Spring Show and Sale is much appreciated.